Many will argue that a child or adult with severe autism may not have the capability to use a wheelchair for mobility because it may be too dangerous for them and others around. While others will state that their loved ones benefit from a wheelchair by gaining easier mobility. The reality is, it depends on the individual with severe autism and their specific circumstances and situation. Some people with severe autism may have the capability to use the wheelchairs for mobility, yet certain things that may trigger epileptic moments that can cause them to lose their ability to have full or any control. 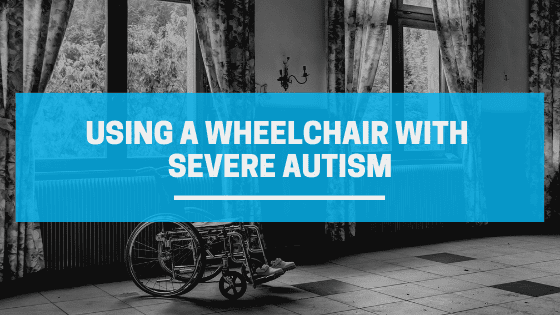 It is important that if an individual with severe autism is always closely supervised to ensure they do not lose control of their wheelchair especially when out in public. One common reason among those who feel that people with severe autism don’t have the ability to use a wheelchair is that they can’t use wheelchairs is because they can lose control and hurt themselves or others. Incidents range from falling off the wheelchairs causing injury to themselves, to losing control and hurting others. When they are closely supervised, this can lower the risk of injuries to themselves and others. At home they are less likely to have incidents making it safer for them to use a wheelchair, however, there should always be supervision. Many supervisors understand where on the spectrum their supervised lay which helps them provide a safer environment for them. For instance, if specific sounds or events can be triggering, they can try to prevent it by providing support to help the individual relax and overcome. Caretakers are also the person most likely to know whether individuals on the spectrum have the capability to use a wheelchair and if it will ease their mobility. Some parents state that their children with severe autism have this capability to use a wheelchair but lose it when they have episodes. However, often these episodes are not constantly triggered, which allows the parent to do daily tasks. One must analyze the situation and environment in which the person with severe autism is able to use wheelchairs to help prevent incidents from occurring. Safety measures should always be taken, and the supervisor should ensure complete control to make sure the person with autism is always safe. For all that believe their child is in total control, they should still be provided with supervision for everyone’s safety.